This platform game by English Software is an old favourite of mine, and I must have spent quite a few hours playing this one. What I really remember about this game is just how colourful the graphics were. I couldn't wait to complete a level so that I could see what new colours would appear on the next one! Jet Boot Jack was first released in 1983 by English Software, and they had a bit of a reputation in the Atari community for releasing decent games for the 8-bit machines. The idea of the game was to help Jack to create a huge vinyl collection in a record production plant. To do this, you had to help Jack collect all of the musical notes by jetting across the platforms and using the lifts to move to a higher or lower platform. However, you had to be careful not to be hit by any moving lifts, and stopping over a lift shaft would be fatal! There were also a few monsters to contend with and some nasty-looking stalactites. 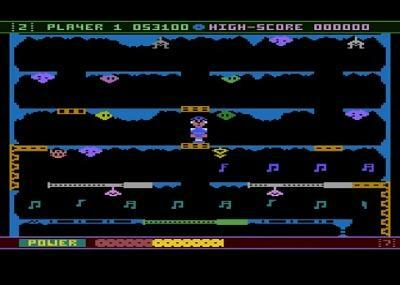 There were just ten screens in all, but you would simply repeat them all at a higher level of difficulty. Ten screens seems like a ridiculously low number these days, but it was pretty much the norm in the first half of the 1980s as home computers simply didn't have the memory capacity to run large games. At first glance this looks like a simple game to play, but it was actually very challenging indeed. Despite the player in the video above making it look easy (he's a skillful player), you really had to focus on what you were doing to complete a level. I found those stalactites particularly frustrating! 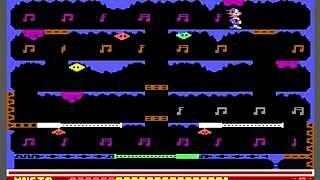 The game was hugely successful for English Software and was also converted for the C64 during 1983. 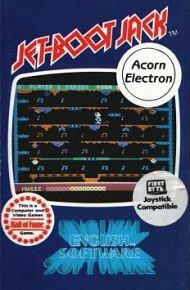 Other conversions appeared in 1984 for the Acorn Electron, BBC Micro and Amstrad CPC. Alan Sugar's Amsoft also published the game in 1985. While there was nothing particularly ground-breaking about the game, it was a very playable platformer with a novel storyline, and it received decent ratings from most computing and gaming magazines. 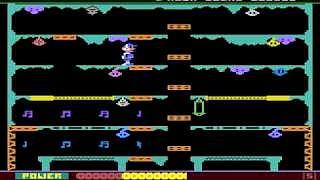 The original Atari version definitely looks, sounds and plays the best and the C64 conversion seems like it was a little rushed and lacks polish, although it is still very playable, thankfully. 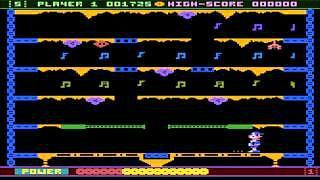 It's still a half decent game, but the SID chip is certainly capable of better title music than this awful racket which sounds like it's coming out of someone's arse!